This lovely little church is a regular port of call of mine. It is difficult to resist it when I'm passing near by. It is about twenty years since I first visited Hinderclay church. My saintly and long-suffering family had dropped me off near Centreparcs in the Thetford forest early that morning, in order that they might spend their day toiling and weeping beside the vast swimming pool there, with its bars, restaurants and modern leisure facilities. I'd have been quite interested to see the inter-denominational Emmanuel Chapel on the site, but I'm not a great one for lying around. Instead, I headed off on my bike, cutting a swathe across the north of the county, along the hideous A11 through Elveden, and then the Grafton estate, through Barnham, Euston and Fakenham. Let us be frank: the Elveden area is not great cycling country. The roads are busy, flat and dull, the villages undistinguished. At Euston, there is a brief vision of horsey poshness. But then, beyond Barningham, the countryside opens up, rolling gently, and bubbling with woods and meadows. This is the Suffolk I know best, and love to cycle through; villages hidden as surprises, church towers peeping over distant hedgerows. It was good to be back. I passed through tiny villages, miles off the main drag; Coney Weston and Market Weston, Knettishall and Thelnetham. Who outside of Suffolk has visited these places, or even heard of them? Indeed, who inside? I tried their names out on friends in Ipswich, none of whom could place any of them. One person knew that Knettishall had been a World War II airfield, that's all. A glorious sight near Thelnetham is the grand sail-mill, working this day, her great sails at a crazy angle, turning impossibly across the field. An 18th century Suffolker dropped back into the modern landscape would probably find this the biggest change, that nearly all these graceful giants have disappeared. And here, the road rolls down into Hinderclay. It was early afternoon by the time I got to this village, which holds a special interest for me. It is one of a handful of Suffolk parishes I know of that has a recorded Knott family, living here in the 17th and 18th centuries. They are not my Knotts - mine all came from east Kent, but it feels like a connection. There are Knott graves in the churchyard, a quiet little place almost entirely surrounded by mature trees, making the church difficult to photograph. The tower is pretty and perpendicular, with little chequerboard patterns set into the bell windows. The letters SSRM in the battlements probably stand for Salve Sancta Regina Maria, which the Catholics amongst us will instantly recognise as the opening words of the<i> Hail Holy Queen.</i> This suggests that the medieval dedication of this church was to The Assumption of the Blessed Virgin. 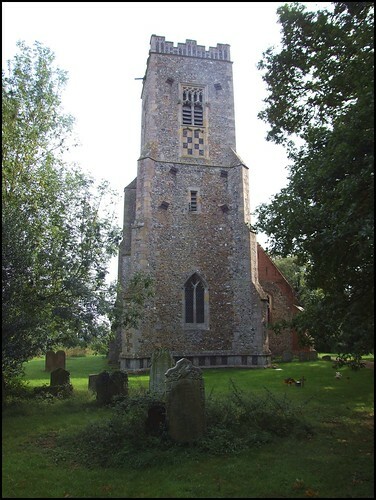 This was the most common medieval Suffolk church dedication, and has been restored correctly in several places, Ufford for instance. The tower appears off-centre, because the south aisle hides the unclerestoried nave. Stepping into this building is a delightful surprise. As it opens beyond the south aisle, the interior, with its uncarved font, pammented floors and simple furnishings is almost entirely rustic, except that it is flooded with coloured light. This comes from the glass in the south aisle. The windows, mainly from the 1980s, are by Rosemary Rutherford. She was the sister of the John Rutherford, rector here from 1975, and after she died in 1972 he adapted her designs to be installed in this church. These are therefore her last works, and they are perfectly poised in their simplicity and abstraction. There is a Baptism of Christ, a nativity scene and the Annunciation, while a Crucifixion is flanked by Mary at the empty tomb and the Resurrection. Perhaps the best depicts Mary Magdalene, tiny at the bottom, anointing Christ's feet. The last window to be installed, at the west end, came in 1994 thanks to the participation of Rowland and Surinder Warboys, two well-known Suffolk stained glass artists. These windows are the best of Rutherford's work, I think. You can see more of it in a number of churches in north Essex, as well as at Boxford and Walsham in Suffolk, and at Gaywood in Norfolk. In a bigger, noisier church, the 1711 memorial to George Thompson would not stand out, but here the rather alarming cherubs are about as discreet as a stag party in a public library. Thompson was from Trumpington in Cambridgeshire, and the inscription tells us in elegant Latin that he died at the age of 28. The benches towards the west date from the early 17th century, when Anglican divines were trying to fill their churches with beauty again. Their hopes, of course, would be dashed by the rise to power of the Puritans. These bear the date 1617, sets of initials, probably those of churchwardens. I was interested to see that one set was SK, my own initials. It wasn't until after my visit that a researcher, seeing my name in the visitors' book, wrote to me and told me that they were probably the initials of a member of the Knott family. There is a comprehensive record of the Guild here, dedicated to St Peter. The alcove in the north aisle probably marks the site of their chantry altar, although there is a large opening from the south aisle chapel, like the ones at Gedding only oriented north-south, which suggests that there was an altar here, too. Hinderclay is perhaps most famous for its gotch, a large, leather beer pitcher used by the bellringers. It has a dedicatory inscription, and the date 25 March 1724, which was New Year's Day that year (and the the feast of the Annunciation, although this wouldn't have been celebrated in those protestant times). It also says From London I was sent, As plainly does appear, It was with this intent, To be fild with strong beer, Pray remember the pitcher when empty. It used to be on display at the Moyse Hall museum in Bury St Edmunds. In fact, I knew it well, having been a regular visitor there, and it was good to place it in its proper context at last. I wondered if any of the Knotts had drunk from it.